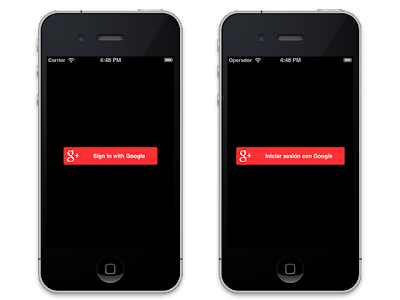 Had a couple of questions recently about Google+ Sign-In in different languages. While its rather common to want to use custom graphics instead of the supplied sign-in button, one of the nice benefits of using the supplied buttons on Android, iOS and the web is that they automatically adapt to the language of the user. Pretty much this post could end there, but there are a few interesting edge cases that are worth mentioning. In general, its a bit of a pain to force the language on iOS - you could update the UserDefaults configuration, but you'll generally need to do that very early in the execution for it to work. The easiest way during testing is just to change your language in the Settings on your device or simulator. However, if you are creating your own button and just want to get the string, that's a bit easier, using the GooglePlusPlatform bundle. Note that this isn't an official part of the API, so the name or the translation string could always change - make sure to test when upgrading between SDK versions! 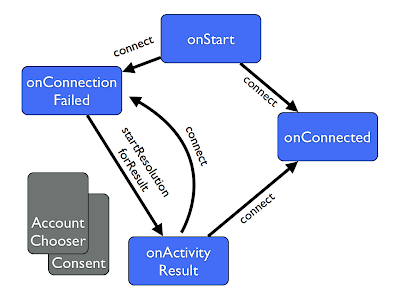 It is a bit easier to hint the language to be used in the consent screen, using the [GPPSignIn sharedInstance].language property - you can pass language code there, e.g "es", or "en-US". One additional thing you might notice though is that different languages actually cause the button to render at slightly different sizes. Particularly if you're not using constraint based layouts, this could cause some unexpected results. Make sure your app accounts for these, or inspect the frame size of the GPPSignInButton after setting the style, and you shouldn't have a problem.